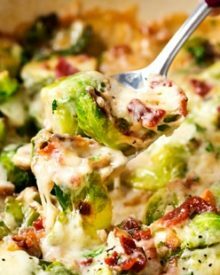 Even if you think you don’t like them, these cheesy Brussels sprouts with bacon will definitely change your mind! Cheesy, creamy, and FULL of flavor! 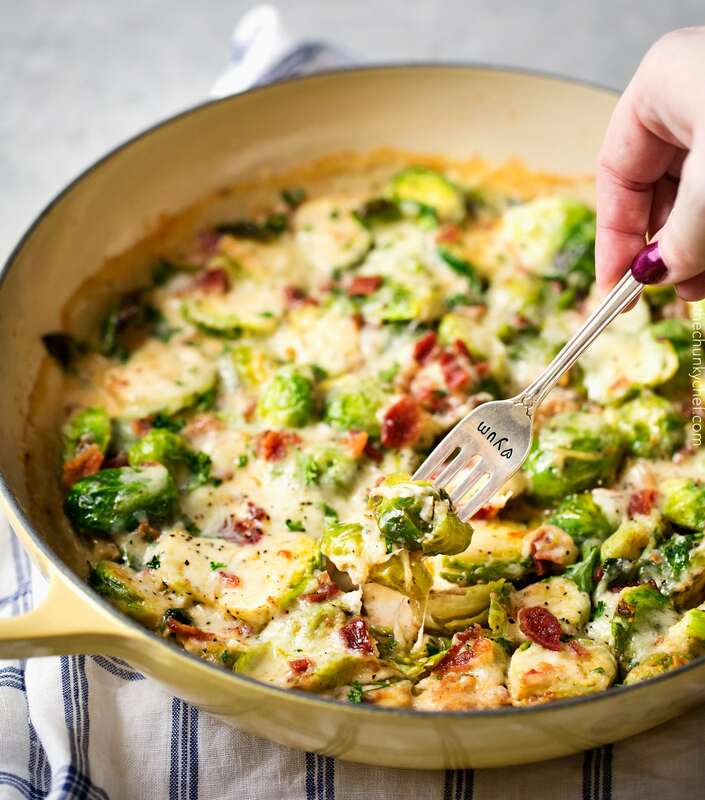 Brussels sprouts are a vegetable that a lot of people aren’t a fan of, but these cheesy Brussels sprouts with bacon will convert just about anyone to a full-on sprout lover!! Growing up, I HATED brussels sprouts… with a passion! My Dad loved them, but even the smell of them cooking would be enough for me to scrunch up my face in disgust. As an adult, I’ve been trying things more and more, and once I tried them sautéed with some hazelnut butter, or roasted on a sheet pan, I realized, I’d be totally missing out. Sprouts are fantastic!! 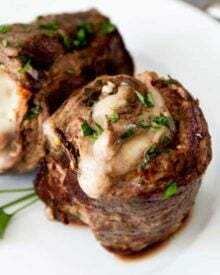 But once I tried them this way, sautéed with shallots and garlic, drizzled with cream, smothered in gooey cheese and topped with crispy bacon… I officially fell in LOVE!! The smell of these brussels sprouts cooking was mouthwatering, and taking the photos for this post was pure torture… I wanted to eat some!! Once this photo shoot was over, I literally stood there eating forkful after forkful before I realized I should probably save some for dinner to share lol. 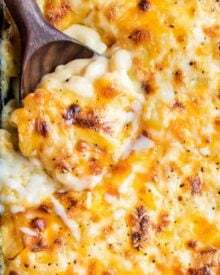 You may have seen recipes like this floating around on Pinterest, but most of them require you to make a béchamel sauce before baking. That certainly isn’t incredibly difficult or even time consuming, but I wanted a recipe you could literally just add things to the pot (after sautéing) and bake. Easy. Peasy. Plus, just look at the gooey results!! The part that takes the longest here, is prepping your brussels sprouts… sometimes those little buggers can be tedious to prepare. Especially for this recipe, when you’re going to want about 32 oz of sprouts (2 lbs). When looking at fresh brussels sprouts, you’ll see a hard little bit of stem at the base. Take a sharp kitchen knife and carefully trim off that bottom stem. Remove any loose outer leaves, and slice in half from top to bottom. Don’t worry if a few other leave fall off during the cooking process. If the sprouts are giant, go ahead and quarter them. 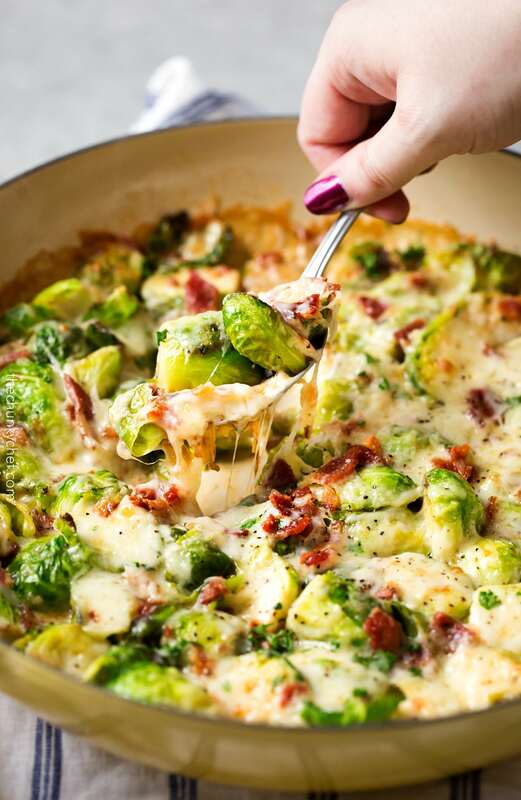 One bite of these cheesy Brussels sprouts with bacon, and you’ll realize how much it was worth it! I can’t tell you that these converted my sprout-hating children… although it did convince my daughter to try one, which is a victory in and of itself.. but for any adults… I think these would absolutely convert them to a sprout lover!! 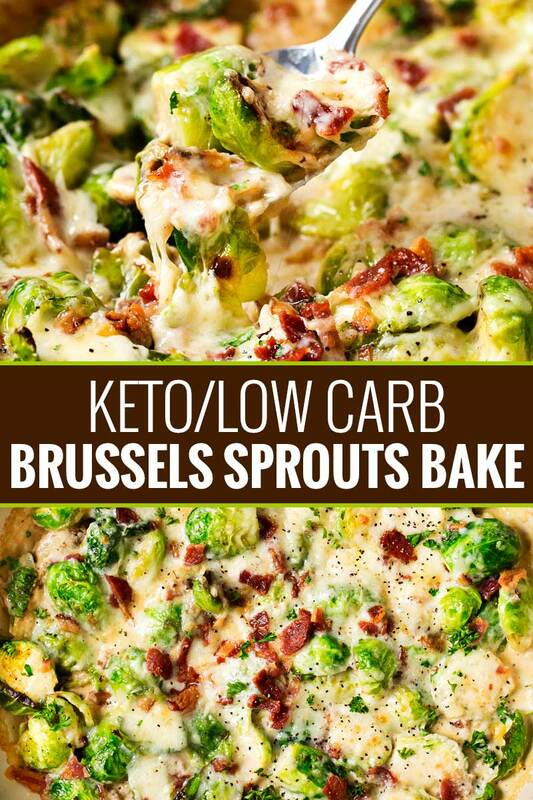 Another reason I love these sprouts (other than the obvious cheese and bacon! ), is that they’re really versatile! the quick cooking time (less than 30 minutes!! 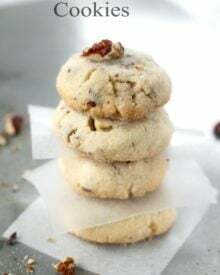 ), makes them ideal to serve on a busy weeknight! they also re-heat really well! In addition to tasting amazing, sprouts are low in calories, high in fiber, full of antioxidants, may help maintain healthy blood sugar levels, and are an excellent source of vitamin K and other nutrients. Oh yeah, that was me totally sneaking a bite!! 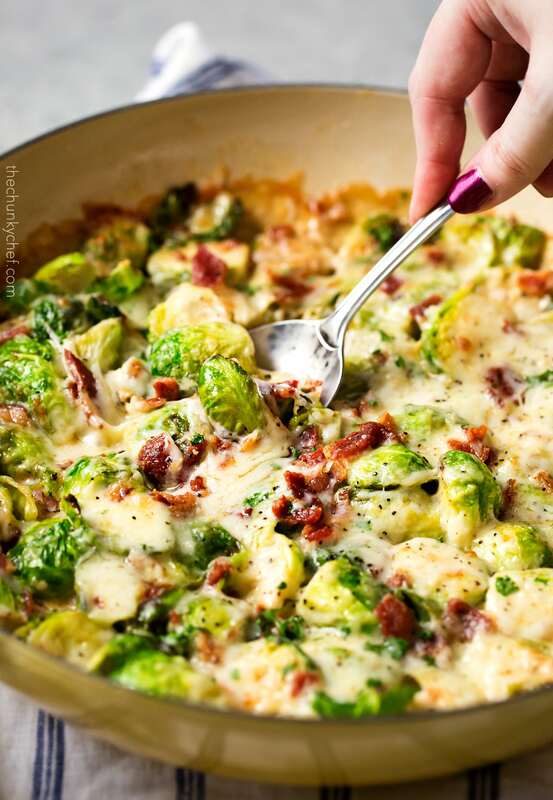 I really hope you all give these Cheesy Brussels sprouts with Bacon a try… you definitely won’t regret it!! 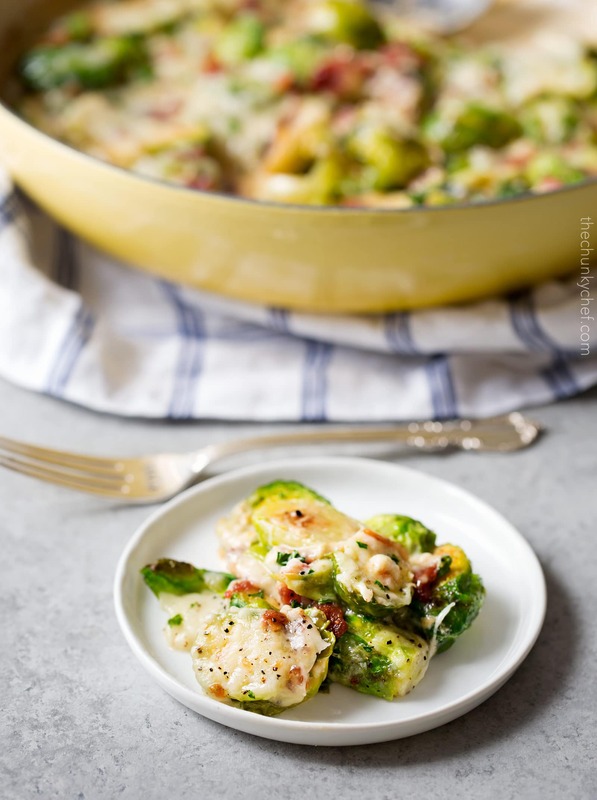 Even if you think you don't like them, these cheesy Brussels sprouts with bacon will definitely change your mind! Cheesy, creamy, and FULL of flavor! Preheat oven to 375 degrees F. Add butter to a large oven safe pan or skillet, and heat over MED heat. Add Brussels sprouts, shallots and garlic, seasoning with kosher salt, black pepper and paprika. Saute, stirring occasionally, about 5-8 minutes. Remove pan from heat, pour in heavy cream. Sprinkle shredded cheddar and gruyere cheese all over the Brussels sprouts. Top with crumbled bacon and bake about 12 minutes, until cheese is melted and bubbly. Sprinkle with additional black pepper and minced parsley if desired. If you desire a more browned cheesy top, broil on high for a minute or so after baking. I’m not a nutritionist, and nutritional values here on my recipes should be used for general information purposes only. This information is not a substitute for medical advice or treatment for specific medical conditions. You should seek prompt medical care for any specific health issues and consult your physician before starting a new diet and fitness regimen. Made this with the Honey, Ginger and Garlic Roasted Pork Tenderlion! My boyfriend loved the meal!!! These were the best brussel sprouts I’ve ever had!!!! Both recipes were easy and delicious!!!!! Has anyone tried this in a slow cooker? Are the nutritional values for the entire dish or per serving? If per serving what’s the size? Thanks! Per serving, and approximately 1 – 1 1/2 cups is the serving size. I don’t measure it exactly, so I can’t be super specific. This is a wonderful dish. “Google a shallot” – really????? You totally rock, chunky chef. My husband has never liked Brussels sprouts, but a friend sent me this recipe and said I must try it. Even picky eaters will love it! Since it’s just the two of us, I halved the recipe. Made it exactly as written and we both loved it!! There was plenty left over, so the full recipe will make a big pan. This one is a definite keeper! If you think you don’t like Brussel sprouts, try this one, it will change your mind. This was outstanding! I didn’t have any papeika and used jack cheese instead of guyere, yet it was very delicious. Will make again but try adding some burger and/or chirizo. I brought this for the family Thanksgiving with the idea I would come home with most of it. Well to my surprise they ate it all, even the little kids. So it’s my go to veggie dish for every event. Can’t wait to take it to a pot luck. Hey there, while I love brussel sprouts my family is adamantly against them (not stopping me from bringing them to every holiday dinner!) 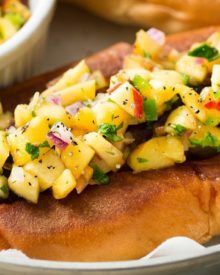 this recipe looks delicious but I don’t want to leave them with no veggies if they still refuse to eat them (their loss=my gain!) so I was thinking about adding another veggie to this, do you think asparagus or broccoli would work in this recipe too? Thanks! Approximately how many servings is this recipe? I want to make for Thanksgiving and wondering if I need to double it? It looks delicious! Approximately 6-8 servings 🙂 Hope you love it! Are the nutrition facts per serving or in total? Made this tonight a bit differently and perhaps more economically. This recipe was so easy! The finished product looked close to the photo, they were so good!! Tgey will definitely be on rotation at my house! Let me just say, this’ll is the first time I have ever had or made Brussels sprouts & these we’re so yummy! It’s so easy to make & I never changed a thing, made exactly as the recipe was written.will make again and again. 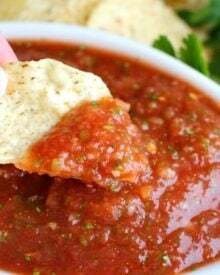 The sauce will go good on anything! 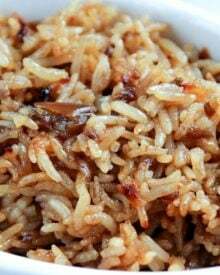 Hi I wanted to ask if you knew how many carbs are in this dish? 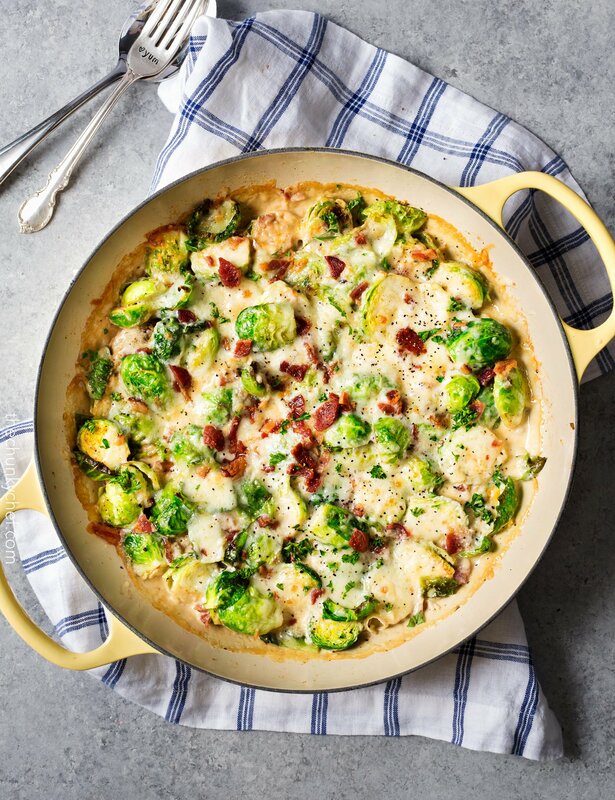 Hi there, I’m making this dish for Christmas tomorrow, and I was wondering if I could transfer the spouts to a casserole dish after sautéing them in my skillet, and before adding the cream and cheese ?? 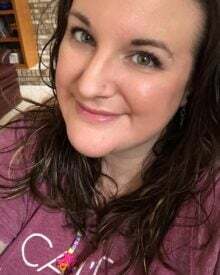 Hi Kendra 🙂 If your skillet isn’t oven safe, then yes, go ahead and transfer them to a casserole dish and add the cream and cheese. Made this for thanksgiving dinner and it was a hit. I had to substitute Asiago cheese for the gruyere since it was what I had. Definitely a keeper. Would frozen brussel sprouts work? Hi Erin 🙂 I’ve never tried using frozen, so I can’t say for sure. If you try it, I’d defrost them first. I still dont see the whole label for the nutritional value if this meal. Hi Caroline. I don’t provide the entire nutrition label, as I’m not a nutritionist and don’t want to give anyone false information. You can easily copy the ingredients into your favorite online nutritional calculator for the full results. 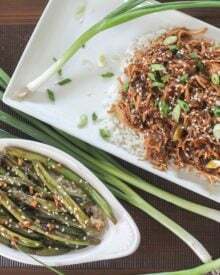 The video uses green onions, not shallots. Google what a shallot is. I made something almost identical to this for Thanksgiving last year. It was a huge hit! Hi Cheryl 🙂 Yeah, I know exactly what a shallot is, thanks though. There was a miscommunication between myself and the video production company that made the video. The recipe works either way… so there’s no need to be rude. Glad your version was a hit! I was gonna say it looked like scallions and not shallots… if both work ok, Which would be preferred. It looks fantastic! Hubs loves his brussels sprouts. Me – I like bacon and cheese – so it’s a compromise os sorts! Thanks Joanie 🙂 Yeah the video production company is located in Australia, and over there, shallots are basically green onions. Shallots are what I prefer… sounds like a great win-win for you and your husband! This looks deelish! Garlic is listed on the ingredients, but no mention of it after that? How do you think this would do,cooking it and eating it at a covered dish lunch a couple hours later ? I woul keep it heated. Hi Mae 🙂 I’ve never done it before, but I think as long as you kept it heated, it should be okay. Once again, I’ve felt in love with your recipe. All of the ingredients match perfectly. I’m looking for some recipes so that I can add more veggie in my little boy’s daily meals. So, thank you so so much! P/s: Your photos are always gorgeous! My kids (and husband!) 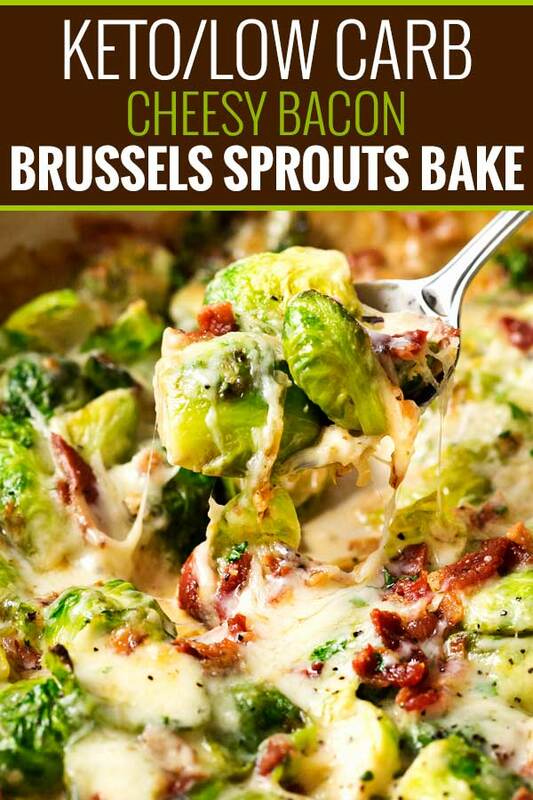 would definitely be more likely to have brussels sprouts especially with this recipe! What a great combination of flavors you have going on! This is exactly how I want my brussels sprouts! Delicious! I don’t think I became a fan of Brussels sprouts until I was on my own and cooking in my own kitchen!! Yes, béchamel sauce is not that hard to put together, but this idea you have for them is quite delectable and so tempting!! My husband loves brussels sprouts and has been trying to get me to like them too. I’ll definitely be making these because adding cheese and bacon sounds like a perfect way to convert me to loving them! Growing up, my dad was never one for much vegetables outside canned green beans and corn, so I thought salad was a fancy, special treat – ha! But there’s something so magical about roasting veggies that make them really shine – and the cheese and bacon?! Oh yes, please. How could anyone not like brussels sprouts when they look like this?! Holy yum!